For the last couple of weeks, I’ve been diving into Lync 2010. I have wanted to learn more about this subject for a while now, but I’ve been busy pursuing other topics like the System Center 2012 release and other exams that I’ve taken like CEH and SCOM. One thing I’ve learned about Lync so far, is that it is huge! Even thou I’ve read alot of Microsoft books in my day, I’m still trying to grasp all the roles and functions that are in Lync. For my study I have been using the «Mastering Lync 2010» Available from Amazon. But what is Lync? (Previously known as Office communications server) Is part of Microsoft Unified Communication products. Lync can be integrated with Exchange, so if you are booked for a meeting from 10 – 12, you will get listed as «busy» in the Lync client. The only two roles that are needed for a basic Lync setup is the Front End Server and the Back End Server (which is the SQL server) if you already have a sql cluster in place you can use that instead of a standalone back end server. In a large enviroment, you would typically have more then 1 Front End Server, they need to be grouped to a Front End Pool, and one of the servers in that pool would need to be set as a Central Management Server, which manages all the configuration deployed to all the servers in the Lync Environment. Application hosting services, for both applications included with Lync Server (for example, Conferencing Attendant and Response Group application) and third-party applications. So the Front-End role is the server that the users actually connect to with their client. The A/V conferencing server, (you can install this on the same server as the front-end server) enables users to have real-time audio and/or video conferences without the need for external services such as the Microsoft Live Meeting service or a third-party audio bridge. If you install this role on a independent server you need to install the a local management store. The Edge Server is the server that external users connect to, this server is connected to the internal and the public network (prefer the DMZ via/Nat) after this is deployed you would have to create an external users policy that you need to deploy for the users. The Mediation role is needed for Enterprise Voice deployment, which is usually connected to your ITSP via a SIP-trunk, or a PSTN gateway or if you have your own IP-PBX. In Lync 2010 this role is collocated with the Front End Server by default. 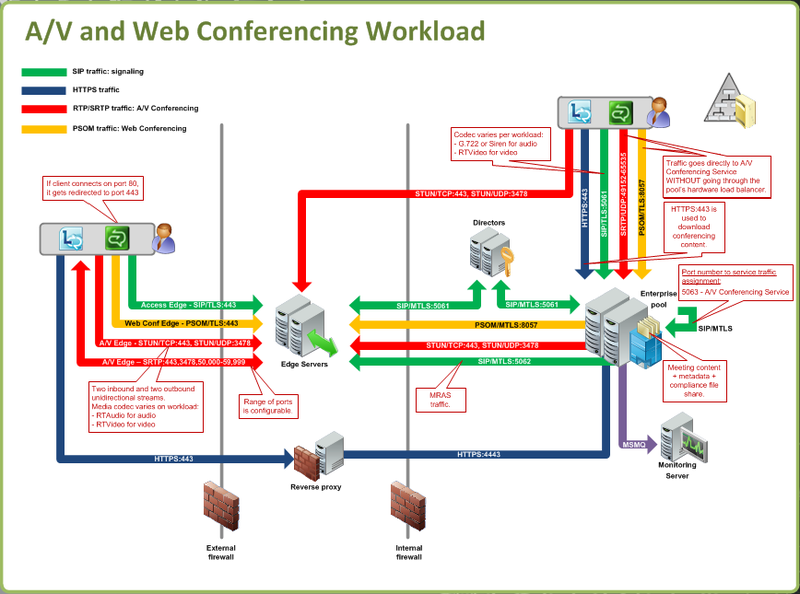 The Lync monitoring role gathers data from Lync endpoints, servers and Lync phones. The data specifies media quality and usage data and stores them in a SQL database. The server also provides access to the data trough a reporting engine. Director role is quite confusing, for internal users it redirects a user to the right client pool ( in a multiple pool environment ) if you don’t have a Director server installed, the user will find a pool via auto discover in dns. For external users, it takes the workload of authentication of the front-end server, so when a user in a external network tries to connect to its Lync environment it will connect trough the Edge server, send a query to the director and then connect to the right client pool. So in case of DoS attack against your lync enviroment, your internal users are still able to connect. 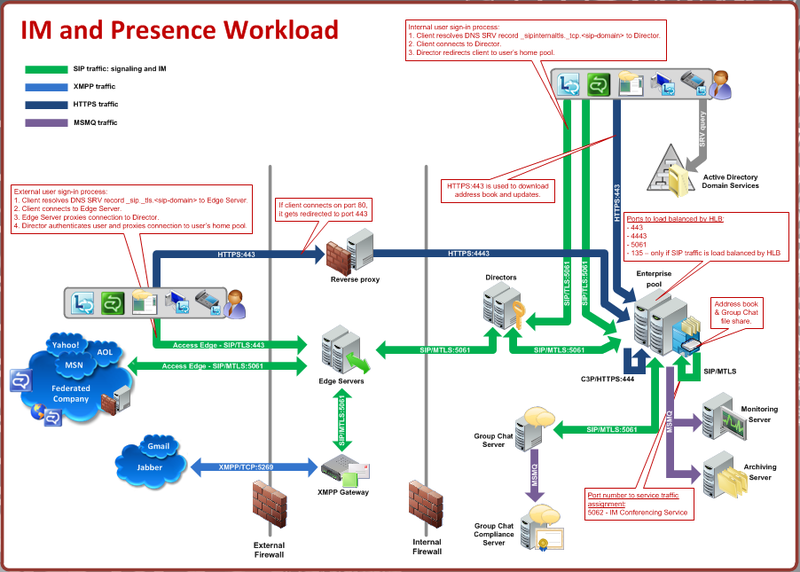 Now all these roles play a vital function in your lync environment, to give you a better picture of it as a “whole” Microsoft has some nice pictures that describes the traffic flow for each role. The first one represents IM & Presence Workload. I always think that a picture describes more that thousand words. As you can see there are two scenarios here, 1 for external users and 1 for internal users. One role that I didn’t describe is the XMPP gateway, which always for federating with other sources of IM such as Google, Jabber etc. 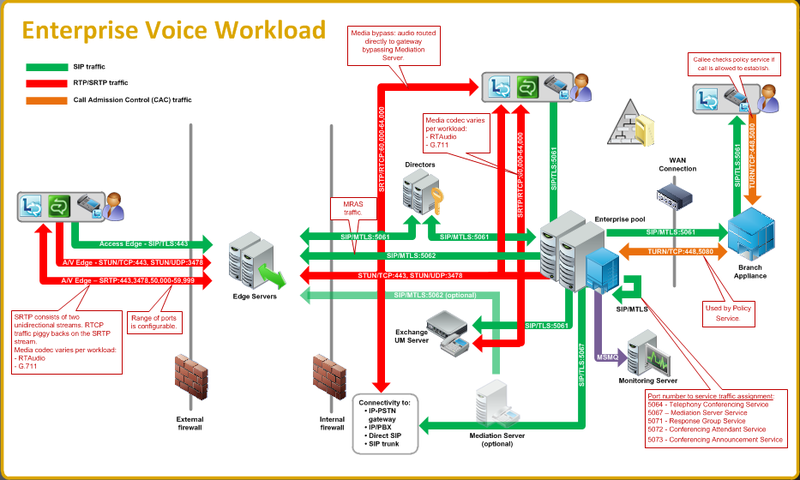 The next one is for Enterprise Voice Workload, which basically is VOIP connected to the PSTN. As you can see here the Mediation Server is set as optional, this is because you usually install this on the same server as the front end server. The mediation server is then connected to the PSTN, or a SIP trunk or a direct SIP connection. The third one is for A/V and Web Conferencing. This is also usually installed with the Front-end server. In case you are looking for more information regarding Lync, stay tuned on the blog. Also if you want sign up for a Office365 trial and give Lync online a try. I also recommend you visit one of the following links.